Sometimes it seems like we can fret and worry as we try to be a certain kind of person. Maybe we want to be wise, or kind, or friendly, or calm. Maybe we want to be playful, or to feel like we always have something to give. But, when we are worried about these things, how can we get anywhere but to a state of being worried? Maybe we get angry, frustrated, restless, impatient, demanding, or fearful. Maybe we get upset at how we’re not where we want to be. 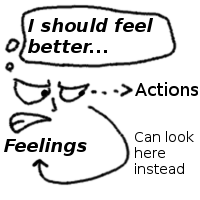 As you can maybe see, we can’t necessarily get to the feelings and states we prefer just by wanting to get there. This want can even take us further away! We can end up in a more negative state just from our desire to be in a positive one. It’s like the problem of being annoyed at being annoyed – it just doesn’t work like that, except maybe as a motivation to look into the issue, since it’s proving to be such an annoyance.